In Professional BoatBuilder I wrote about a site visit to marine engine manufacturer Volvo Penta’s on-water test facility in Krossholmen, Sweden (see “Euro Vision” in issue No. 167). Though a thoroughly modern company, Volvo Penta has roots that can be traced back to the mid 1800s. As I learned during my research, the name offers a glimpse into that history—and a bit of technology history too. “Volvo” is Latin for “I roll.” Svenska Kullagerfabriken (SKF) is a Swedish ball bearing manufacturer whose early product description—”[b]all bearings, roller bearings, machines, transmissions, automobiles, bicycles, rolling-stock, transportation devices”—included a lot of rolling devices. It originally intended to use the name “Volvo” for a bearing destined for the U.S. market in 1915; however, the project was halted with the start of WWI, and the name was shelved until the introduction of the automobile in 1927, for which it seemed equally appropriate. It all started here. Not a true diesel, the B1 would become the first Volvo. The name “Penta” goes back even further. The Grönvall company was a foundry and mechanical shop established in 1868 in Skövde, Sweden. 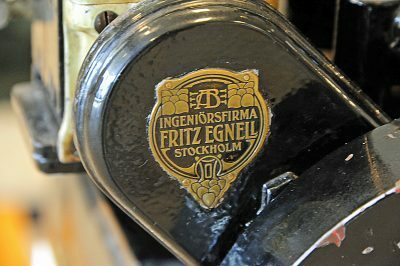 In 1907, the managing director of the foundry, John G. Grönvall, two of his members of staff, and Fritz Egnell, of the Fritz Egnell Company, and his chief engineer, Edvard Hubendick collaborated to develop the company’s first engine, the B1. In 1916, Egnell purchased the Grönvall company and changed the name of the combined outfit to commemorate the five individuals who developed the B1. That company, Pentaverken (the Penta Factory or Works, “penta” being Greek for the number five), went on to manufacture marine engines primarily. The Volvo MD1 heralded the introduction of a novel concept in a small marine diesel, a reverse gear. 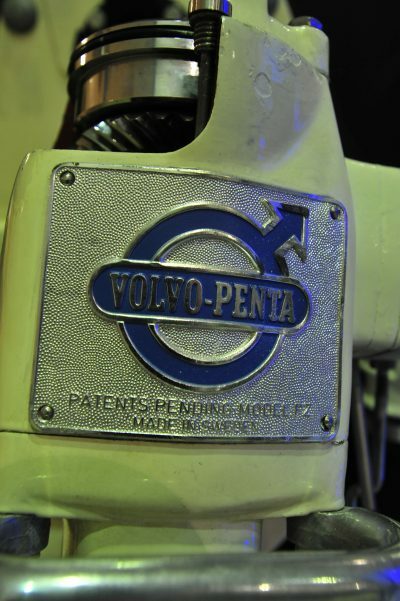 The growing Volvo automobile company, which relied on Pentaverken for motors, purchased its supplier in 1935, marrying the Volvo and Penta names in the brand that endures today. While in Sweden, I also visited the Volvo Museum. Located a short drive outside Volvo’s home port of Gothenburg, and opened in 1995, it’s an extravaganza of all things Volvo, containing a spectacular grouping, from sports cars and military vehicles to tow trucks and earth moving equipment, as well as aircraft engines (Volvo Aero manufactured aircraft, guided missile, and rocket engines until 2012, when it was acquired by GKN, a manufacturer of, among other things, ball bearings). The museum also houses an impressive collection of marine engines, including a B1, U2, and Hesselman engines, an Aquamatic sterndrive, and reams of printed Volvo and Volvo Penta archival material. 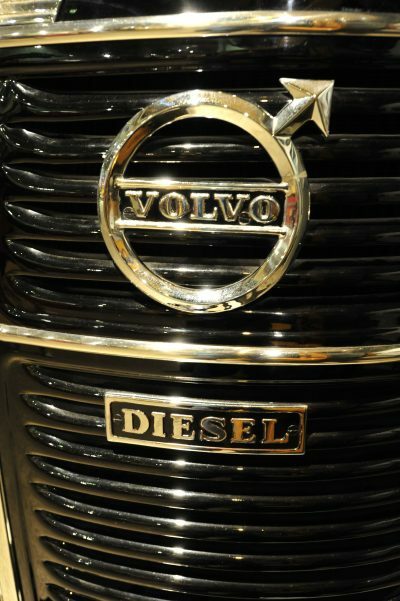 The first Volvo diesel, introduced shortly after WWII, quickly gained popularity, while spawning many descendants through the present. Another relic on display was the Volvo “grill badge,” a circle with an arrow pointing to the 2 o’clock position. It’s the ancient metallurgical symbol for iron, as well as being representative of the Roman God of War (and thus male gender) and the iron and steel from which ancient war implements were manufactured. Sweden has a long production history of connecting steel and strength with attributes of safety, durability, and quality. After visiting the Volvo Museum, I queried the director as to which Volvo Penta products used the Volvo “iron” symbol. 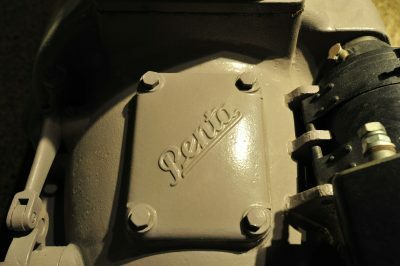 The response was, “To my knowledge, Volvo Penta haven’t used the iron mark but always the Volvo Penta word.” However, the Aquamatic sterndrive displayed at museum clearly includes that symbol. That example notwithstanding, it appears to have been used rarely on Volvo Penta products. Few Volvo Penta products wore the “iron badge.” The Aquamatic was one exception. Subscribe to Professional BoatBuilder magazine to read the story mentioned above and access the past year’s archive. It’s free for qualifying members of the marine industry.